Without fungi, life as we know it would not exist. Fungi play essential roles in the environment: as mycorrhizal partners with plants, as recyclers of organic material in all ecosystems and in the formation and maintenance of soil structure and functioning. Mycologist Pam Catcheside will look at the fungal kingdom, the variety of fungi, their ecology and their roles in the environment. 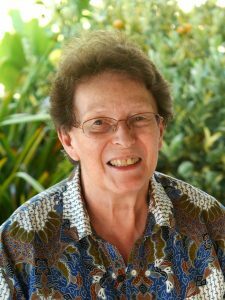 Pam Catcheside was born in London, England, studied Botany at Imperial College, London University and taught Biology in senior schools in England before coming to Australia. In Adelaide she taught Biology and Science at Woodlands School for 25 years. Pam has been collecting and documenting the larger fungi of South Australia for over twenty years. She is an Honorary Research Associate at the State Herbarium of South Australia and Convener of the Adelaide Fungal Studies Group. She is presently co-editor of a field guide to Australian fungi. Pam is co-recipient (with David Catcheside) of Nature Conservation Award from Field Naturalists Society of South Australia (2007). In 2010 she was awarded Unsung Hero of South Australian Science and in 2015 was inducted into the South Australian Womens’ Honour Roll for Service to Mycology. Pam has published a number of scientific papers including descriptions of new species of fungi. She has also been interviewed for radio and television.